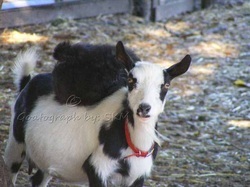 Welcome to the web home of Mac's Rainbow Nigerian Dwarf goats. Why Nigerians? They are small they milk and they are not Pygmies. They make great 4-H projects and it also helps when there is a breeder near by who is happy to work with you. Nigerians originated in Africa and as they have been improved and refined by breeders here in the US they have become the dairy goats they are today you will still find some that don't milk a lot but more and more you will find herds with better milk production. That is what I am working towards with my herd. I started my herd as a 4-H project and I showed at the county fair and I did a few of the open shows, in my area, there weren't many. As I got to be too old for 4-H I got to the point were I didn't want to show in the open shows. So I haven't done a lot of showing but it looks like I will be doing a little bit and I do milk. I work to improve what I have by breeding to better bucks. I have had several great mentors through the years who have helped me learn to see a good dairy goat. I have had some does in the past that are not Nigerians. I have almost always had a large breed doe, a doe with some Pygora and the one Dwarf Nubian. But I now have an all Nigerian herd at this time. For more on how I got started and what breeds I have had go to the history page. Mac's Rainbow resides in the small town of Lebanon, Oregon in the mid-Willamette valley on just over a quarter of an acre which shows how good Nigerians are for small homesteads. It also makes it so I have to be creative in how I keep my herd down one of the ways I am working on that is by milking through, that is milking a doe for more then a year without breeding her during that time. This is a work in progress so as I get a chance to work on it I will be adding things and exchanging pictures as I get new ones.